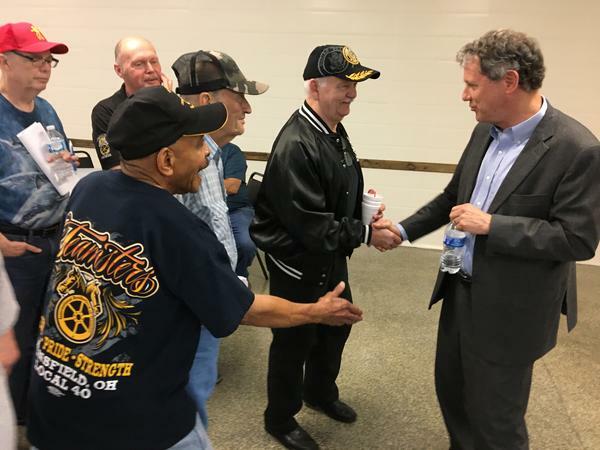 Ohio Sen. Sherrod Brown meets with teamsters in Ohio during a forum. Ohio’s Democratic U.S. Senator is kicking off the second leg of his tour of the early presidential primary states. Sherrod Brown is closer to making a decision about a possible run for the White House. Ohio Sen. Sherrod Brown is embarking on the second leg of his "Dignity of Work" tour. Sherrod Brown said, like in Ohio, there are many Iowa communities dealing with the challenges of bad trade deals and globalization. And Brown said people are gravitating towards his “Dignity of Work” message. “I think that people everywhere have recognized that their work has not been rewarded the way it used to be -- that they’re working harder than ever," he said. Brown plans to decide whether he wants to run for president by March.